Percy has been busy in his workshop for days, but what on earth is he making? All the animals get a shock when Percy emerges sitting on a very strange machine… his new lawn mower! The animals jump aboard for what turns out to be a very bumpy ride, as the mower suddenly launches off into the sky! They’re having a great time… until the engine fails and the machine begins to fall. But – thank goodness – some sheep in the field below volunteer to provide a soft, woolly landing! 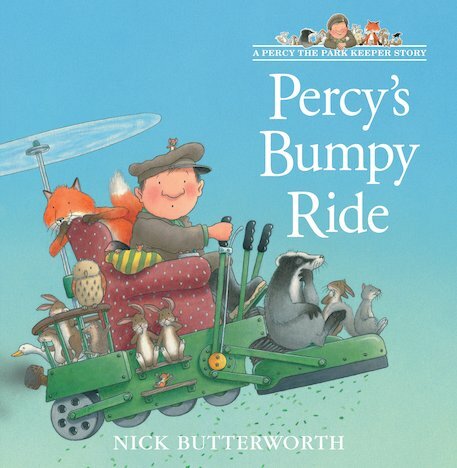 At the end, a very grateful Percy rewards the kind sheep by offering them the long unmown grass in his park as a tasty treat… From the rich imagination of Nick Butterworth, this lovely outdoor story shimmers with suspense and magic.